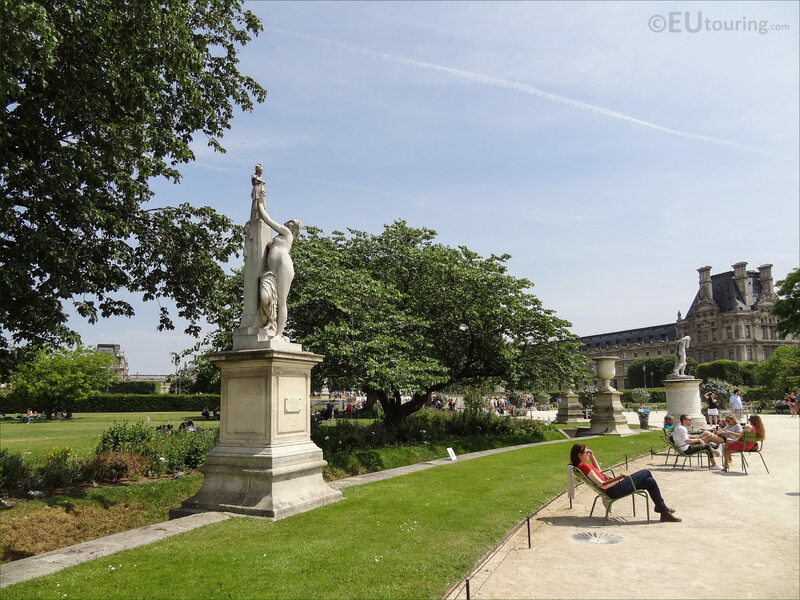 We were in the 1st Arrondissement of Paris at the Jardin des Tuileries, when we took these high definition photos showing a statue called Cassandre se met sous la protection de Pallas, which was sculpted by Aime Millet. 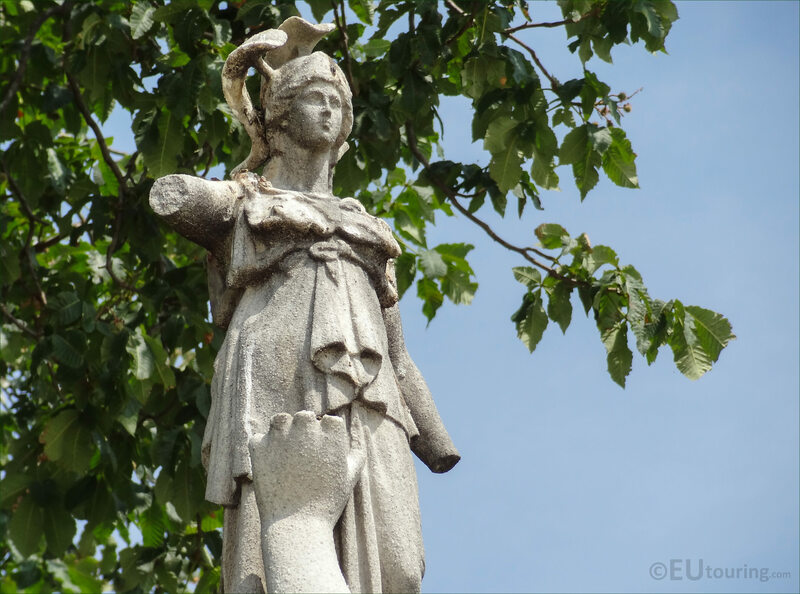 This first HD photo shows the statue called Cassandre se met sous la protection de Pallas, which in English generally translates to Cassandra seeking the protection of Pallas, although this is also sometimes referred to as Cassandra placing herself under the protection of Pallas. 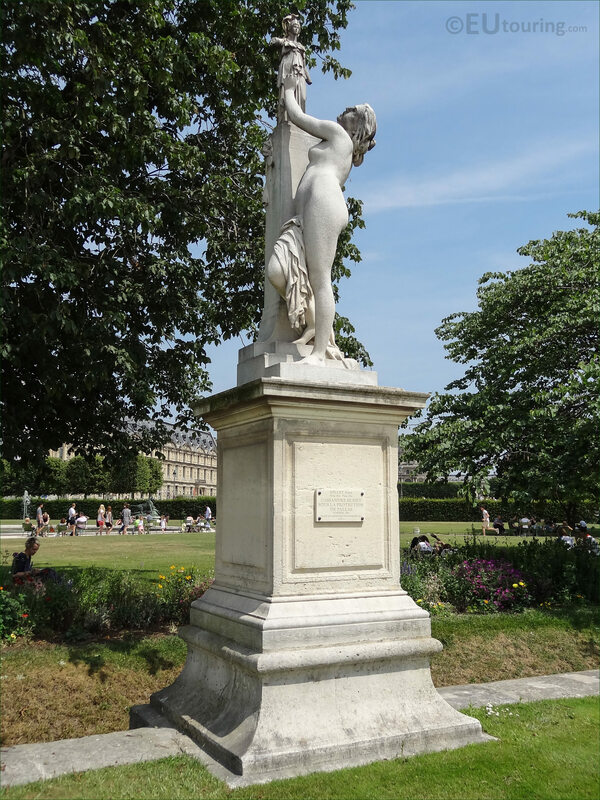 So here you can see the entire statue, which was sculpted in marble, and was placed on a tall pedestal for display within the Jardin des Tuileries, and this was first presented at the Paris Salon for French artists in 1877, prior to being placed within the gardens at a similar time to other statues by prominent sculptors of the time. Yet the photograph above shows the small statue with two snakes or serpents by the head, and this is designed to represent Pallas, who was actually the daughter of Triton in Greek mythology, that was killed by Athena who took her name as Pallas Athena and produced a statue of her out of remorse, and the snakes are there referring to wisdom or knowledge. Cassandre se met sous la protection de Pallas was sculpted by Aime Millet, who was born in Paris in 1819 and initially started studying in the studio of Viollet-le-Duc, then went to the Ecole des Arts Decoratifs, before entering the Ecole des Beaux Arts studying under David d'Angers to become a French sculptor. 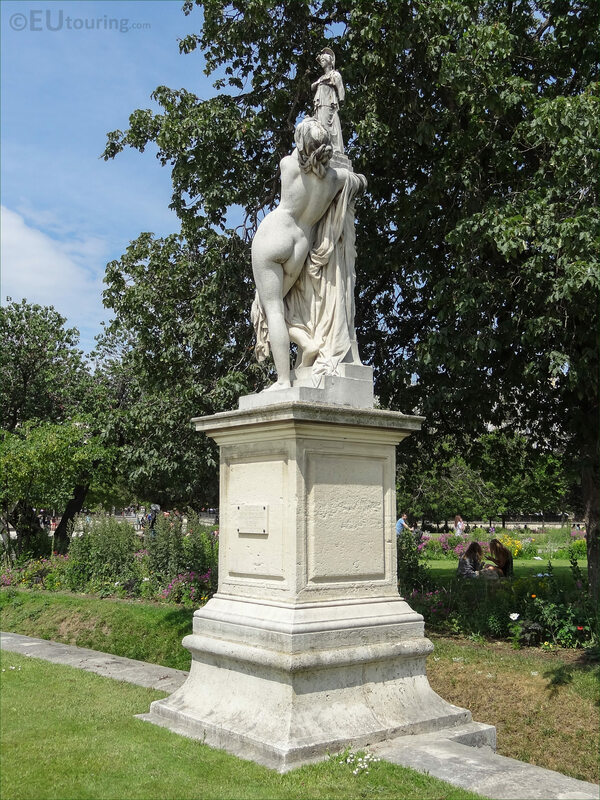 Aime Millet then started presenting works at the Paris Salons and received numerous orders and commissions for statues and sculptures to adorn tourist attractions including the Palais Garnier, Jardin du Luxembourg, the former Palais du Trocadero, with the statue now being at the Musee d'Orsay, several for the Eglise de Saint Vincent de Paul and for the Musee du Louvre. 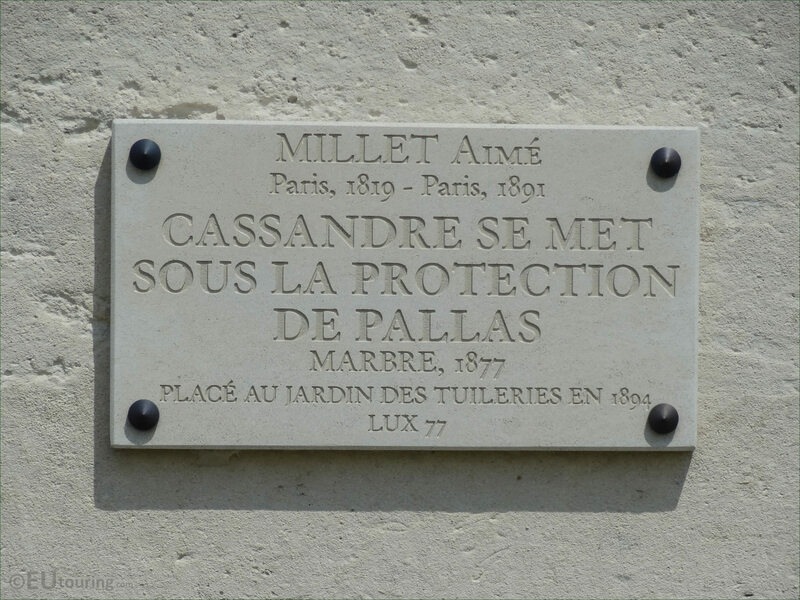 And Aime Millet also received many different awards and medals throughout his career, and one of them was for this particular statue of Cassandra seeking the protection of Pallas, sometimes just called Cassandre, or Cassandra in English, that is located within the Grand Carre area of the Tuileries Gardens, which is maintained by The Louvre Museum. 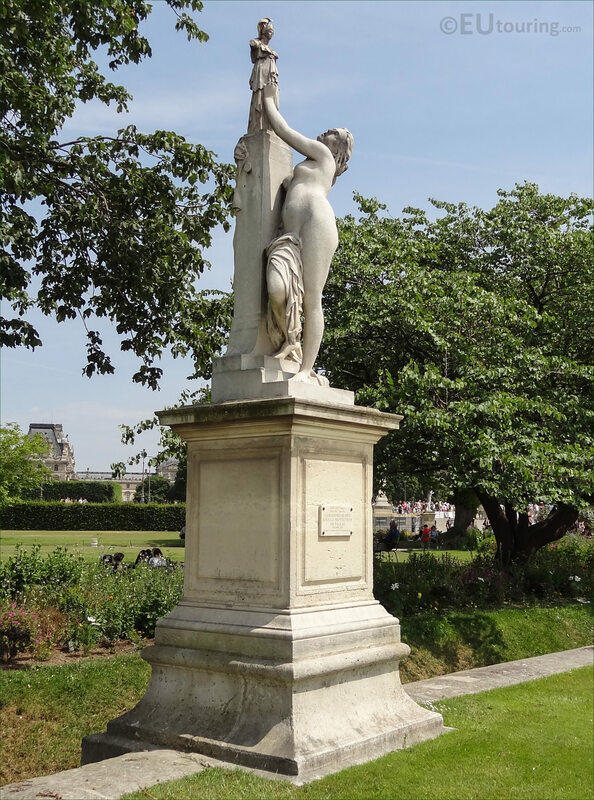 However, this close up photograph shows the tourist information plaque located on the pedestal base at the front, which provides some details about the statue and its sculptor, and as you can see here, although this was produced in 1877, it did not get placed within the Jardin des Tuileries until 1894. Now in Greek mythology one of the stories about Cassandra, was that Apollo gave her the power of prophecy in order to seduce her, or to make love to her after Cassandre had consented in order to obtain foresight, yet she then refused, and because of this, Opollo inflicted a curse so that no one would believe anything she said. 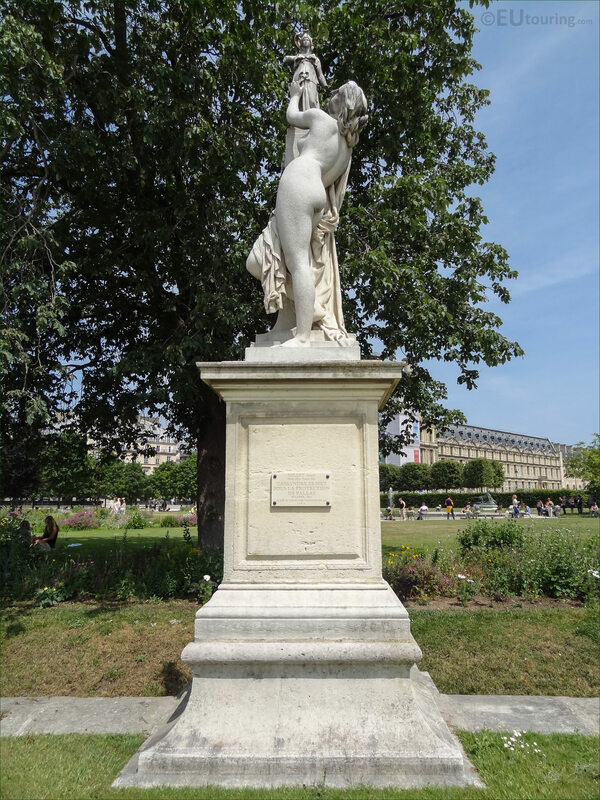 So we mentioned earlier that the statue of Cassandre se met sous la protection de Pallas is located in the Grand Carre area of the Tuileries Gardens, and this is one of twelve statues positioned around the Grand Bassin Rond, which is the Large Round Pond, and this is by the grass area called the Demi-lune Reserve nord that you can see behind, with the Louvre Museum on the distance.